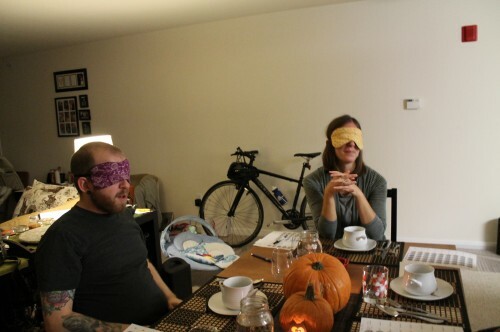 Saturday night we hosted a blind tasting of nine different pumpkin beers. 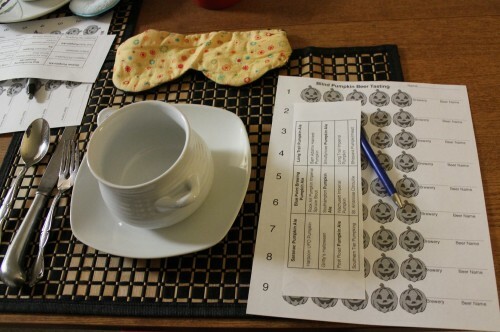 I chose the beers out of our stock of 16 pumpkin beers and created the score cards as well as decided to make a game out of it. The person who correctly identified the most beers by name and brewery (Neil excluded) won a bottle of Switchback, a local brewery who just started bottling their beer. To go along with the beer we asked our guests to bring something to share. Laura brought baguette and pumpkin seed oil (to go with the theme) as well as chips and guacamole. Taylor and Emily brought a delicious harvest salad filled with Brussels sprouts, beets and walnuts and I made the main dish a butternut squash soup. 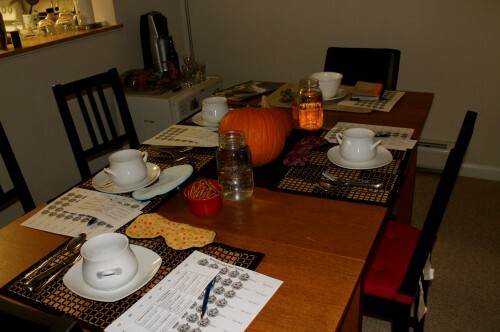 Everything was so delicious and the perfect pairing to the pumpkin beers. Winner of the most correct answers was Laura with 3/9! 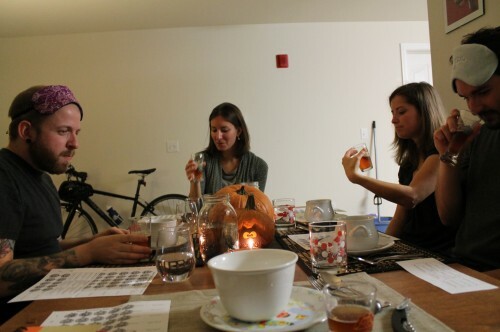 Q: What is your favoritej pumpkin beer? My favorites so far are Six Point Autumnation, Sam Adams Fat Jack and Wachusett Imperial Pumpkin Ale. Over the past few months Neil and I have been working on watching the Bourne Trilogy with our good friend Laura who is obsessed with has all three of the movies. 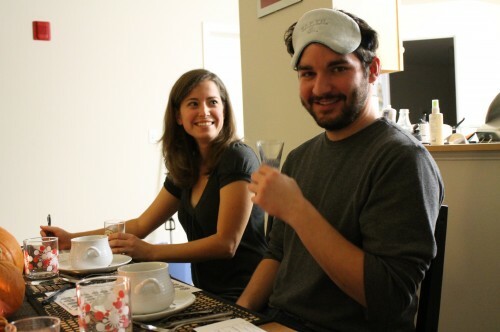 Since Neil and I had never seen any of the moveis we decided to do a series of movie nights with drinks and dinner. Saturday night we finally were able to get together to watch the final movie, The Bourne Ultimatum. We were going to just do popcorn and pumpkin beers but Neil and I ate a late lunch and then both ran so we were hungry for something more substantial than just popcorn. We decided to pick up a vegan pizza from Leonardo’sto have with our popcorn and beer. The pizza was super tasty but unfortunately my stomach didn’t agree, as good as it tasted I ended up with a stomachache by the end of the night due to all the soy cheese. Along with our movie, pizza and popcorn we also tasted a variety of Pumpkin beers. Below are the ones we tasted starting with my favorite to my least. Sorry Blue Moon you were awful. Now that we’ve finished the Bourne Trilogy we need to think of new movies to watch …hmmm any ideas? 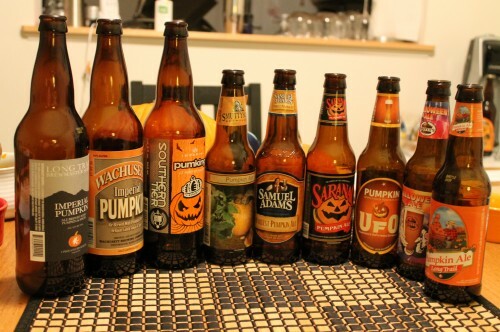 What is your favorite pumpkin beer?